We love our scottie dog Christmas card! Don’t be fooled by this cheeky Scottish Terrier’s glum look, he’s just tired out from pulling all the decorations off the tree, that’s all! Know someone who owns a Scottie dog? If so then this detailed black and white sketch of Scotland’s favourite pooch is the perfect card to send your Christmas wishes in! Printed on an ivory stock and with a red foil bauble printed on (for that simple, festive touch!) 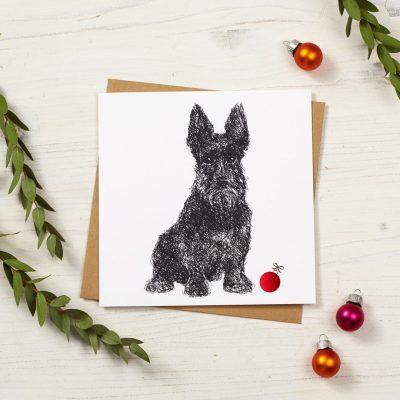 our loyal scottie dog Christmas card measures 15cm x 15cm and comes with a Kraft brown envelope. The card is blank inside for you to write your own seasonal greeting.